PABA Welterweight Champion Tewa Kiram (38-0. 28 KOs) and lightweight contender Mercito “No Mercy” Gesta (31-1-2, 17 KOs) hosted a media workout today at Westside Boxing Club in Los Angeles, Calif. ahead of their respective world championship bouts. Kiram will take on former interim WBC Super Lightweight Champion Lucas “La Maquina” Matthysse (38-4, 35 KOs) in a 12-round fight for the vacant WBA Welterweight World Title, while Gesta will take on WBA, WBC Diamond and Ring Magazine World Champion Jorge “El Nino De Oro” Linares (43-3, 27 KOs) in a 12-round battle. The action takes place on Saturday, Jan. 27 in a special double main event at the “Fabulous” Forum in Inglewood, Calif. The doubleheader will be televised live on HBO Boxing After Dark®beginning at 10:30 p.m. ET/PT. On the non-televised portion of the card, Armenian welterweight prospect Ferdinand Kerobyan (7-0, 4 KOs) will face Lucius Johnson (4-1-1, 3 KOs) in a six-round welterweight fight. In an exciting and rarely-seen battle between two undefeated prospects, Los Angeles native Tenochtitlan “T-Dog” Nava (7-0, 1 KO) will participate in an eight-round 126-pound clash against Las Vegas’ Francisco “El Alacran” Esparza (6-0-1, 2 KOs). Romero “Ruthless” Duno (15-1, 13 KOs) will fight for a second consecutive time at the “Fabulous” Forum in an eight-round lightweight battle against Sacramento, Calif.’s Yardley Armenta (21-9, 12 KOs). Kerobyan, Duno and Nava also participated in today’s workout. The non-televised undercard action will be streamed live on www.RingTV.com beginning at 3:05 p.m. PT/ 6:05 p.m. ET. “My opponent’s name is Lucius Johnson, and he’s been a pro for a while now. We’ve done our research, and I’m looking forward to putting a great show for my fans and come out with a great victory. After fighting 7 times in 2017, I’m hoping this year I’ll be fighting for a championship belt. I want to get more experience on the way, and with experience I’ll be a more complete fighter. “The win against Christian Gonzalez gave me a lot of opportunities. I was immediately signed and now I’m doing better than ever. I will give a good fight on Jan. 27, and we can show the world to never underestimate me. I’ve prepared well, and I’m ready for the next level and to take on even tougher fights. World Championship, and is presented by Golden Boy Promotions in association with Arano Box and Galaxy Promotions. 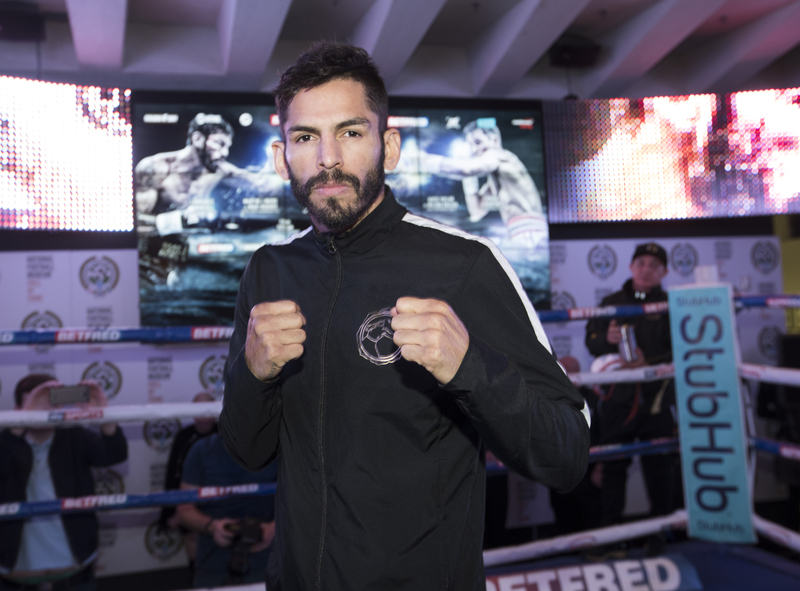 Linares vs. Gesta, a 12-round fight for the WBA, WBC Diamond and Ring Magazine Lightweight World Championships is presented by Golden Boy Promotions in association with Teiken Promotions. The event is sponsored by Tecate, “THE OFFICIAL BEER OF BOXING,” Hennessy “Never Stop, Never Settle,” and Casa Mexico Tequila. The event will take place Saturday, Jan. 27, 2018 at the “Fabulous” Forum in Inglewood, Calif. and will be televised live on HBO Boxing After Dark beginning at 10:30 p.m. ET/PT. The non-televised undercard action will be streamed live on www.RingTV.com beginning at 3:05 p.m. PT/ 6:05 p.m. ET. Tickets for Matthysse vs. Kiram are currently on sale and are priced at $10, $25, $50 and $100, not including applicable service charges and taxes, with a total ticket limit of 12 per person. To charge by phone with a major credit card, call Ticketmaster at (800) 745-3000 or the Forum Box Office (Monday through Friday 11:00 a.m. PST to 7:00 p.m. PST) at (310) 330-7300. Tickets will also be available for purchase at www.fabulousforum.com or www.ticketmaster.com. pasting the link http://bit.ly/MatthysseKiram into a browser. Credit must be given to Golden Boy Promotions for photos and videos used.